This is the time of year when singers we know and love are graduating from our three local music conservatories; it is a bittersweet time for us. We are thrilled for their accomplishments and excited about their summer programs and young artist programs; we feel sad because we will miss them; we always hope they will stay in touch and let us know how they like their "new homes". 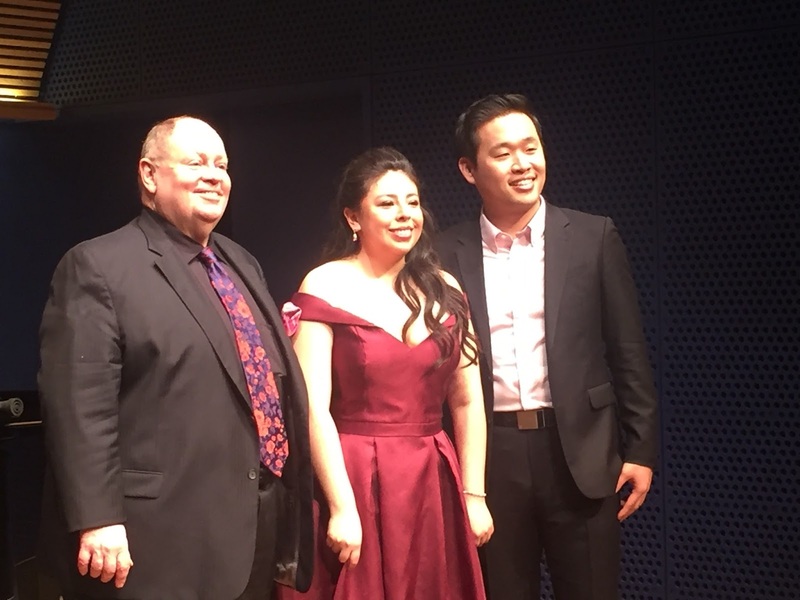 Thankfully, Opera America's Emerging Artist Recitals series (the last of the season) presented two singers who won the Alan M. and Joan Taub Ades Vocal Competition; the purpose of the competition is to select singers who possess outstanding talent and potential for careers in opera. As pointed out by Dona D. Vaughn, Artistic Director of the MSM Opera Theater, the winners' prize money is used to support the singers' professional development in many ways, subject to approval. Competitors are selected from among students getting their degrees from Manhattan School of Music. The top three winners this year were baritone SeokJung Baek, mezzo-soprano Hongni Wu (who just won the Met National Council competition) and soprano Shaina Martinez, all of whom are being awarded their Masters of Music degree. Onstage last night in Scorca Hall at the National Opera Center were Ms. Martinez and Mr. Baek, both covering wide musical territory that revealed their versatility. They were accompanied by the always wonderful Craig Rutenberg whose light touch and sensitivity toward the singers always impresses us. Ms. Martinez opened the program with "Come scoglio", from Mozart's Cosi fan tutte; Ms. Martinez' sizable soprano was put in the service of Fiordiligi's resoluteness in the face of temptation. Whilst negotiating the huge leaps Mozart wrote (purportedly to embarrass an unpopular soprano) and some lovely embellishments, she managed to portray a young woman who "doth protest too much". This soprano is poised onstage and able to use expressive gestures to amplify her expressive voice. She switched gears for two selections from Poulenc's Fiançailles pour rire which shows Poulenc's lighter side--the languorous "Violon" and "Fleurs" with its delightful piano part. Her French was quite good. But, for reasons of our own, we got the biggest thrill from her singing in Spanish, a language that resonates with us on par with Italian. We heard a trio of songs by the 20th c. Argentinean composer Carlos Guastavino. Ms. Martinez' partnership with Mr. Rutenberg was outstanding in "Pampamapa" with its vigorous rhythms. In "Abismo de sed" she sings "Soy cantor" (I am a singer) and we smiled. The third song was "Hermano". Even better was "Hija del amor" from Gonzalo Roig's zarzuela Cecilia Valdés in which a mother vows to protect her daughter from the romantic betrayal she has endured. The air was thick with passionate intensity and we were transported. This versatile artist, having done justice to opera, art song, and zarzuela, joined Mr. Baek for the duet "Nedda! Silvio!" from Leoncavallo's Pagliacci. The pair left no doubt about the high stakes they were facing. Ms. Martinez limned Nedda's conflict; Mr. Baek used every strategy he could to persuade her to leave Canio--seduction, promises, and even guilt. Meanwhile, Mr. Rutenberg's piano sustained the tension. Mr. Baek is similarly versatile and we were very happy to hear two of his "signature arias" which he performed in 2016 when we was an Opera Index Competition winner. His facility in French has gotten even better with more legato in the line; his interpretation of Valentin has also grown. His baritone is capable of silky smoothness and also vigor. In "Avant de quitter ces lieux" he used the vigor as he sang of battle and a smooth tenderness when he spoke of his love for Marguerite. His voice swelled to a passionate climax. The other "signature piece" is Tosti's "L'alba sepàra dalla luce l'ombra" sung with great depth of feeling. We think we understood the meaning of the song for the first time. Renato's rage at Amelia, the wife he wrongly suspects of infidelity, is the subject of the aria "Eri tu ce macchiavi quell'anima" in Verdi's Un ballo in maschera. Only an artist can reveal both the outer contempt of Renato whilst letting the grief and pain peek through. Looks like we have a new Verdi baritone worth celebrating! In yet another manifestation of versatility, he captured the wry humor of "La Maîtresse volage" by Poulenc. Two other songs from Chansons gaillardes were "Madrigal" and the rather naughty "L'Offrande" in which Mr. Rutenberg's piano portrayed the postulate's innocence. From Copland's Old American Songs we heard the tender "Long Time Ago" and the jaunty "The Boatmen's Dance". They were sung in crystal clear well-enunciated English and given the grace and simplicity they require. It was over all too soon. Mr. Baek leaves for San Francisco Opera's Merola Program and then will be a resident artist at Lyric Opera of Kansas City. We wish all good things to these artists but also to all of the wonderful students getting their degrees from MSM this month. We wish we might have heard all of their graduation recitals.